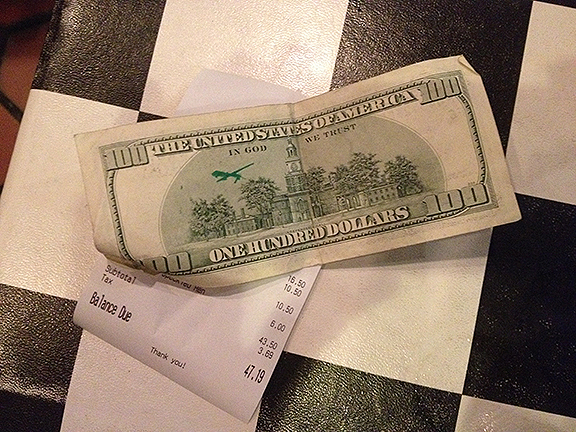 A participatory project inviting volunteers across the United States to rubber stamp a tiny image of an MQ1 Predator Drone on the back of their money. The idea came after closely examining U.S. currency – all but the $1 dollar bill feature a pastoral depiction of a notable government building or monument on the back of the bills, albiet with lonely, empty skies. It seems appropriate, considering our current use of drones in foreign skies, to symbolically bring them home to fly over our most notable patriotic structures. I’ve created 100 of these laser etched and hand assembled rubber stamps which are currently being shared with volunteer participants throughout the United States and a few internationally. I’ve invited participants in the project to each send me one image of a stamped bill, noting location and date where the bill was stamped and put back into circulation. The project has been created as part of my work as an Artist in Residence at Instructables.com/Autodesk Inc. Further images will be posted in the coming weeks.